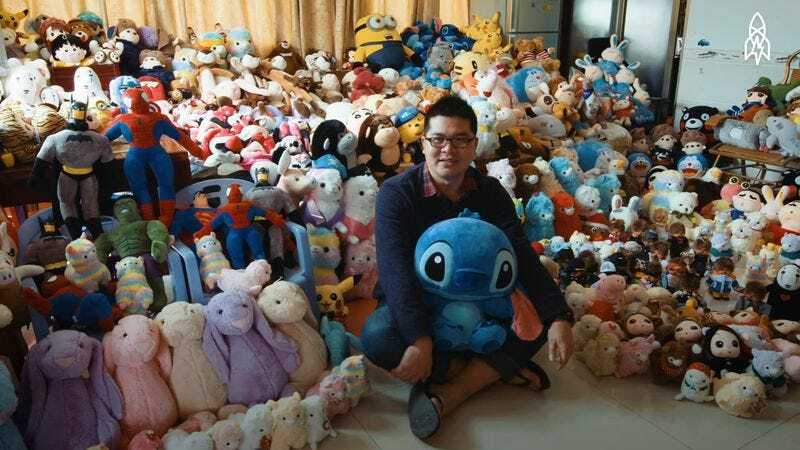 That glorious human specimen surrounded by plush dolls is Chen Zhitong, a man who’s so good at getting toys out of claw machines that he won more than 15,000 dolls in 2016, according to a video profile of the 35-year-old by Great Big Story. A native of Xiamen, China, Zhitong says claw-machine operators are have taken notice of his skills and are not happy when he rolls around to clear out their machines. He says that some go so far as to buy him meals and beg him not to play. Zhitong offered a few pointers for anyone looking to get a leg up on these fickle games, although he definitely didn’t give up his best secrets. There are two kinds of claw machines, he explains: ones that you can defeat if you’re good enough and a “programmed” variety that no amount of skill can overcome consistently. He also shared what he believes are the three things that determine whether it’s possible to win at a given machine: the tightness of the claw, the “angle of claw rotation,” and the layout of the dolls in the machine. By adhering to those rules and exercising his world-class doll-snatching abilities, Zhitong amassed a collection so big that it took over his apartment and had “become a real burden,” so he donated 1,000 of them to schools for the deaf and the blind. Talented and charitable!